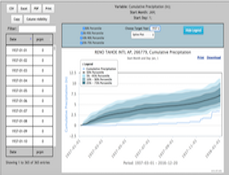 Obtain precipitation, temperature, heating degree days, cooling degree days, and Standardized Precipitation Index maps on the national, regional, and state level with this tool. Discover the risk for Stewart's Disease of corn in the northeastern United States with this tool which is based on winter temperature data accessed via ACIS. 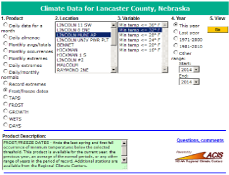 This tool provides a regional look at temperature and precipitation as well as providing historical context. This tool is ideal for weather trivia and comparisons. 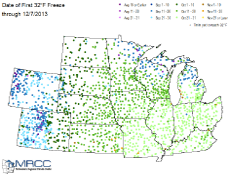 This tool displays the date of the first fall freeze for a wide range of states spanning from Colorado and Wyoming in the west to Ohio and Kentucky in the east. 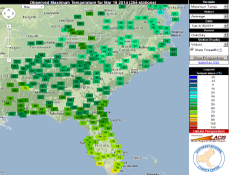 Developed by the Southern Regional Climate Center, the Climate Extremes Portal graphically displays daily, monthly, and all-time temperature and precipitation records for weather stations throughout the United States. 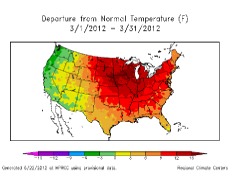 This suite provides a variety of tools for summarizing and visualizing climatological data. 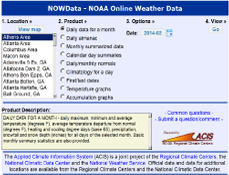 Tables, graphs and maps can be created based on the ACIS daily, monthly and seasonal station and gridded datasets. This platform was developed at the Western Regional Climate Center in support of the Southwest Climate Science Center. It serves as an access point for climate and remote sensing data and analysis tools. Developed by the Midwestern Regional Climate Center using ACIS, this snowfall climatology tool shows the average number of days certain amounts of snowfall occur at over 1800 stations nationwide. 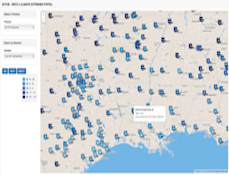 Led by the National Drought Mitigation Center, this atlas uses ACIS to provide historical drought information so that decision makers can assess their risk to drought. 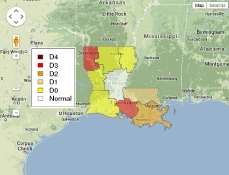 Developed by the Southern Regional Climate Center for the SCIPP RISA, this tool displays the severity of drought along with the amount of precipitation needed to break it. 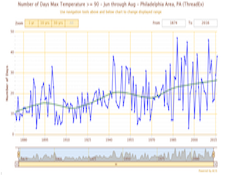 Developed by the Northeast Regional Climate Center for use by the National Weather Service, users can obtain daily and monthly data in addition to extremes information. 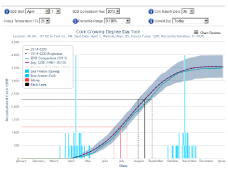 Based off of gridded data available in ACIS-WS, this tool tracks real-time and historical growing degree day (GDD) accumulations and allows users to assess frost risk. 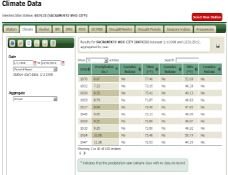 Developed for use by the USDA NRCS, this tool helps field offices obtain daily and monthly data along with record extremes, frost/freeze dates, and growing degree day data. 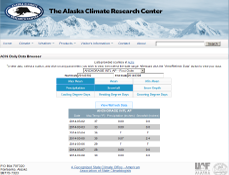 This data browser, developed by the Alaska Climate Research Center, shows daily data from sites in Alaska. Users may obtain temperature, precipitation, and degree day data. 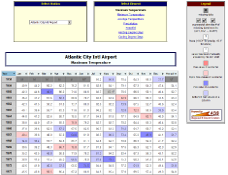 Developed by the Office of the New Jersey State Climatologist, this tool uses ACIS to provide monthly data for select stations in New Jersey as well as a nice visual of monthly extremes. 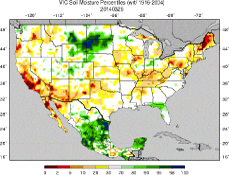 These modeled soil moisture maps from the University of Washington are developed using the Variable Infiltration Capacity Macro-scale Hydrological Model which uses ACIS.